Year on Japanese coins is the the year of the current emperor's reign followed by his name. You'll find the year by locating the 年 character which means "year". Over the years, writing direction changed. 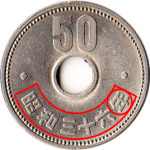 Hence, the 年 character is left of year on older coins, right on the date on recent coins. As an example the coin on the right reads "昭和三十六年", which means "year 36 (三十六) of the reign of emperor Shōwa (昭和)", that is 1961. The date lettering usually uses the following scheme: [Emperor name] [Year number] 年. In order to convert to Gregorian year, you need to add the year number to the year before he was enthroned. Numbers greater than 9 write as follow: [tens figure] 十 [unit figure]. If the unit figure is 0, it is not written. Same for the tens figure when its value is 1. Be careful, with older coins (年 left of the date), you must read right to left. For example, 五十二 reads 25.
is 1926 − 1 + 2 = 1927. 年八十治明 means "year 18 of the Meiji era" (readinf right to left), that is 1868 − 1 + 2 = 1869.